﻿﻿ 5G Antennas: Breakthrough Wireless Technology | MET Laboratories, Inc.
(July 23, 2018) - Qualcomm announced a major step forward in implementing 5G hardware into cellular devices for use in 5G wireless and mobile networks. The QTM052 mmWave antenna module and QPM56xx RF module allow for 5G frequencies to be accessed in conjunction with a 5G modem to deliver download speeds far exceeding those of today’s 4G capabilities. 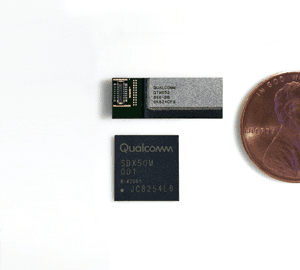 Qualcomm announced a major step forward in implementing 5G hardware into cellular devices for use in 5G wireless and mobile networks. The QTM052 mmWave antenna module and QPM56xx RF module allow for 5G frequencies to be accessed in conjunction with a 5G modem to deliver download speeds far exceeding those of today’s 4G capabilities. The new hardware implements millimeter wave (mmWave) technology and sub-6GHz in the antenna modules to deliver download speeds of up to 5Gbps using mmWave and 500Mbps using sub-6GHz. As a reference point, 4G networks used today peak at speeds around 70Mbps. The implementation of mmWave technology is a key step forward into full 5G integration, as the challenges associated with signal interference when using mmWave frequencies have historically prevented engineers from taking advantage of the faster speeds. The mmWave antenna technology works around the signal interference challenges by using a combination of an antenna array, which consists of between 8-12 antennas, and beamforming technology to direct signals in the most effective possible pathway. The mmWave modules are also extremely compact, allowing for multiple modules to be used in the same device to ensure signal interference is mitigated to the highest degree possible. The new, compact 5G antenna modules that will be used in mobile phones present undeniable opportunities for cellular manufacturers to accelerate the implementation of 5G capabilities into their devices. However, there will also be additional challenges to ensure final regulatory compliance for devices that implement new technologies. Specific Absorption Rate (SAR) – With the addition of up to 48 antennas into a mobile device and beamforming technology, human exposure to RF energy and fields generated by 5G technology will face a substantial increase. Designing effective shielding mechanisms that do not degrade wireless performance will be of the utmost importance. For manufacturers, it will be critical to verify acceptable levels of RF energy emissions at varying stages of the 5G module implementation to avoid over-engineering the shielding methods. Antenna Characterization – 3D antenna pattern measurements will be needed for both individual antennas, as well as arrays. These measurements will be unique in the fact that the 3D output can shift over time and the arrays will refocus on the client device due to the possibility of both ends of the link to be moving. This presents testing challenges because most current OTA chambers cannot handle the higher frequencies, in addition to the precision that is present in 5G devices. Beam widths may be only a few degrees, which for example, prevents an OTA chamber with 10-degree spaced receive antennas from obtaining the precision measurements required. Output Power and Spurious Emissions – All measurements made by these tests must be radiated, as the antennas and arrays are integrated directly into devices. This will prevent a co-axial connector on the PCP from being accessed for the purposes of testing. With over 30 years of wireless testing experience, Eurofins | MET Labs is ready to help manufactures deliver the next generation of wireless technology to consumers across the globe. Our regulatory experts are well-versed in the unique considerations associated with 5G hardware testing and our electromagnetic compatibility laboratory in California has already undergone expansions to accommodate new technology and testing requirements that will be required for 5G technology. With product development cycles set to release the first iteration of mobile 5G devices throughout late-2018 into early-2019, we can help you develop a comprehensive testing plan to evaluate device compliance throughout the product development phase. With a combination of EMC pre-scans and periodic device compliance reviews, we can help you identify any product deficiencies to meet your target product release date.